Do you want to have spectacular views of the outdoors, and plenty of natural light to brighten up your home? This summer, replace your old and worn down windows with first-class picture windows from Renewal by Andersen® of St. Louis. We can provide you with picture windows that help bring the outside inside, and give you all the benefits of summer sunlight without any of the drawbacks. Our picture windows can be customized for any opening. If you want a stunning floor to ceiling vista of your surroundings, large picture windows would be perfect for your windows installation in St. Charles, MO. This immense view is possible because our picture windows are made of patented Fibrex® material. This material has the low maintenance features of vinyl, with the insulation and strength of wood. Since our window frames are strong, the narrow frames can support a large amount of glass. This maximized glass area will give you a clear and enormous view of the outside from the comfort of your home. Along with the view, our windows can also provide you with a lot of natural light this summer. Natural light is fantastic in bringing out the true color in your décor, while helping decrease stress. Combined, it’s a great way to give your house a more joyful atmosphere. Don’t worry about sunlight’s drawbacks, such as fading furniture, and heat; our special High-Performance™ Low-E4® glass can block 84% of harmful UV rays. This glass option is also 56% more energy efficient in summer and 45% more energy efficient in winter because it reflects solar heat away. Your home will stay cool, and your air conditioning will no longer be overworked. For your home in St. Charles, Missouri, energy efficient windows are the smarter choice. Depending on climate and geography, our glass solutions can help cut your energy bills by up to 25%. Since our picture windows can come in different sizes, these are flexible and can be combined with different window types. Let your imagination run wild as you mix and match different window types for your openings. Additionally, our picture windows feature 47 exterior/interior color combinations, and a wide selection of grille patterns. With this amount of customization, you can create the perfect image for your home. If you want great views with better ventilation, casements with picture windows would be great. We also make specialty windows in assorted shapes and sizes that would work well with picture windows. Our beautiful and energy-efficient windows will provide you with a wonderful view of your surroundings, enhancing the look of your home. 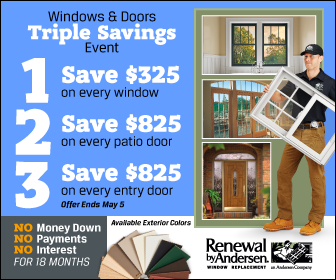 Renewal by Andersen of St. Louis is dedicated to providing you with the best window replacement experience possible. Working with us means you’ll have a stress-free, professional, and effective speedy project. Give us a call to learn more about our picture windows, or to schedule a free estimate.